An optional Reform form object in the operation deserializes and validates input. The form object can also be used for rendering. Wanna see some code? Jump right here! Since Trailblazer decouples the High-Level Stack from the framework, it runs with virtually any Ruby framework. We are constantly working on documenting how to do that. Trailblazer with Hanami - coming soon! Trailblazer with Roda - coming soon! Trailblazer with Grape - coming very soon! Trailblazer offers you a new, more intuitive file layout in Rails apps where you structure files by concepts. Files, classes and views that logically belong to one concept are kept in one place. You are free to use additional namespaces within a concept. Trailblazer tries to keep it as simple as possible, though. run Comment::Create # Comment::Create is an operation class. return redirect_to(comment_path op.model) # success! Operations don't know about HTTP or the environment. You could use an operation in Rails, Hanami, or Roda, it wouldn't know. This makes them an ideal replacement for test factories. An operation is not just a monolithic replacement for your business code. 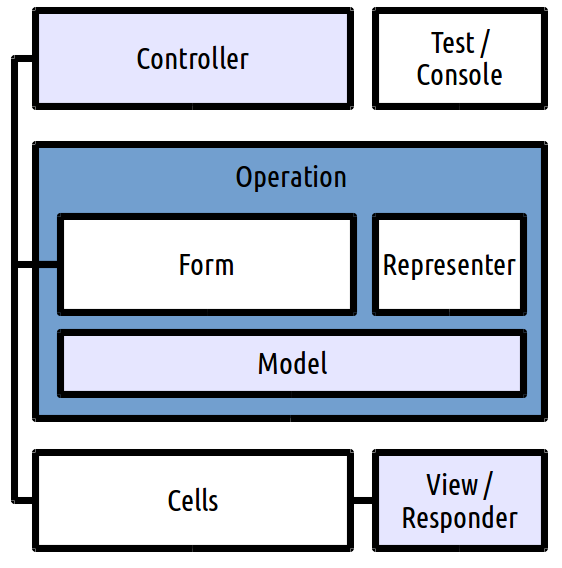 It's a simple orchestrator between the form object, models and your business code. Operations only need to implement #process which receives the params from the caller. In Trailblazer, an operation (usually) has a form object which is simply a Reform::Form class. All the API documented in Reform can be applied and used. The operation makes use of the form object using the #validate method. # this is a Reform::Form class! The contract (aka form) is defined in the ::contract block. You can implement nested forms, default values, validations, and everything else Reform provides. In the #process method you can define your business logic. Post-processing logic (also known as callbacks) is configured in operations. Callbacks can be defined in groups. They use the form object's state tracking to find out whether they should be run. on_change :markdownize_body! # this is only run when the form object has changed. Callbacks are never triggered automatically, you have to invoke them! This is called Imperative Callback. callback! (:after_save) # run markdownize_body!, but only if form changed. No magical triggering of unwanted logic anymore, but explicit invocations where you want it. form Comment::Create # will assign the form object to @form. Please buy it: Trailblazer - A new architecture for Rails. The demo application implements what we discuss in the book. Generated on Wed Apr 3 00:45:43 2019 by yard 0.9.19 (ruby-2.5.1).